The Dubois County Republican Party met for their Lincoln Day Dinner today at the Huntingburg Event Center, with special appearances by Congressman Larry Bushon, President Pro Tempore of the Indiana Senate Rod Bray, US Senator Mike Braun, and Indiana Governor Eric Holcomb. Indiana State Senator Mark Messmer, who emceed the event, explained that the Lincoln Day Dinner is a great fundraiser for the G.O.P. and a fantastic get together for the party. Messmer greeted the crowd before introducing US Senator Mike Braun, who gave an update on what’s going on in Washington D.C along with talking about his experience being around United States President Donald Trump. A special sit down interview between Messmer and Indiana Governor Eric Holcomb took place with Messmer asking different types of questions ranging from policies and public support to even his dog Henry and his many social media accounts. 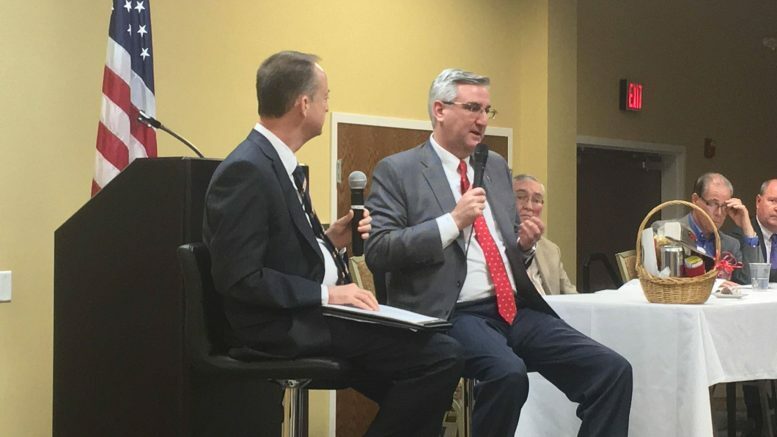 One question that stuck out is what does Eric Holcomb want out of Indiana? Holcomb also stated that his favorite accomplishments so far while being Governor of Indiana is the records Indiana is breaking and the power of local leadership. Mark Messmer said that the sit-down interview was an easier way to stay engaged as an audience member when the message is told in a more personal manner. Messmer says that the fact that Holcomb shows how much of a team player he is really reflects on the community. The day ended with a simple auction fundraiser that saw the likes of wine, chocolate, cakes, and pies auctioned off to patrons at the dinner. Be the first to comment on "Lincoln Day Dinner Brings In Holcomb and Braun For Talks About Their Experiences In Government"